BUENOS AIRES, Argentina (AP) — The International Monetary Fund agreed Wednesday to increase a lending package with Argentina by $7.1 billion to a total of $57.1 billion, seeking to calm markets over the country’s ability to meet its debt amid growing economic turmoil. Argentina had secured $50 billion in financing as part of a deal worked out with the IMF in June after South America’s second-largest economy was battered by a run on the Argentine peso amid double-digit inflation. IMF Director Christine Lagarde said Wednesday that Argentina’s central bank has agreed as part of the deal to intervene in currency markets only in case of extreme circumstances and that the new amount will help Argentina’s government face its challenges. “The Central Bank of Argentina has decided to adopt a floating exchange rate regime without intervention,” Lagarde said at a joint news conference with Argentine Economy Minister Nicolas Dujovne in New York. Argentine Central Bank Chief Guido Sandleris later told reporters that under the revised deal, the central bank initially will intervene only by selling $150 million worth of pesos a day when the currency drops below 34 pesos or rises above 44 pesos per U.S. dollar. 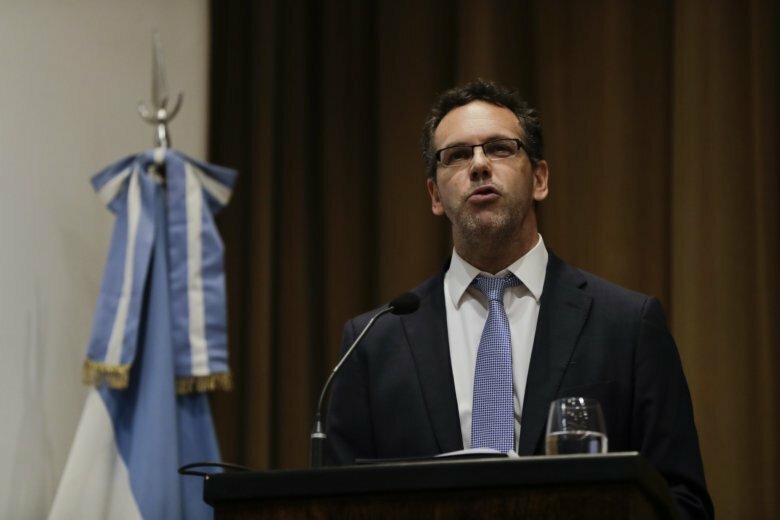 “This will allow us to reduce inflation and recover the stability and predictability in prices that Argentina so badly needs,” said Sandleris, who was named to the job Tuesday after Luis Caputo surprisingly resigned. The new deal will also speed up disbursements to $13.4 billion from $6 billion previously agreed for this year and to $22.8 billion from $11.4 billion previously approved for 2019. Argentina has been badly hit by a severe drought that has damaged crop yields in the world’s third-largest exporter of soybean and corn. The situation worsened beginning in the first quarter of 2018 as world oil prices rose and then interest rate hikes in the United States led investors to pull dollars out of Argentina. That caused panic among Argentines, who have stashed away dollars as a cushion since the country’s worst crisis in 2001 when banks froze deposits and the currency tumbled. The rush to buy dollars led the peso’s value to collapse. Despite several interest rate hikes by the Central Bank, the peso has lost more than half its value this year, making it one of the world’s worst performing currencies. Following the run on the peso, President Mauricio Macri began pushing for early IMF disbursements under a revised deal. He aimed to restore investor confidence and ease concerns that Argentina will not be able to meet its debt obligations next year. Consumer prices are rising at an estimated annual rate of about 40 percent. Many Argentines joined in a nationwide strike Tuesday to protest Macri’s handling of the economic crisis and his decision to turn to the IMF for help. Most Argentines blame the international lending institution for encouraging policies that led to the country’s economic implosion in 2001. It resulted in one of every five Argentines being unemployed and millions sliding into poverty. The IMF has admitted it made a string of mistakes that contributed to the economic implosion. A 2004 report by the IMF’s internal audit unit concluded it failed to provide enough oversight and overestimated growth and the success of economic reforms, while it continued to lend Argentina money when its debt burden had turned unsustainable. Without further IMF support, the government was forced to declare a record $100 billion sovereign debt default.